The baking for the Christmas cookie tray continued in earnest today with these little bite-sized treats. I had never had pfeffernusse before (ok, I've had the Swedish peppernut but it's quite different from these) but they are traditional for Matt's family. Apparently, they are originally Dutch but many other countries have versions of this crunchy, spiced cookie but all include a small bit of pepper in the recipe. 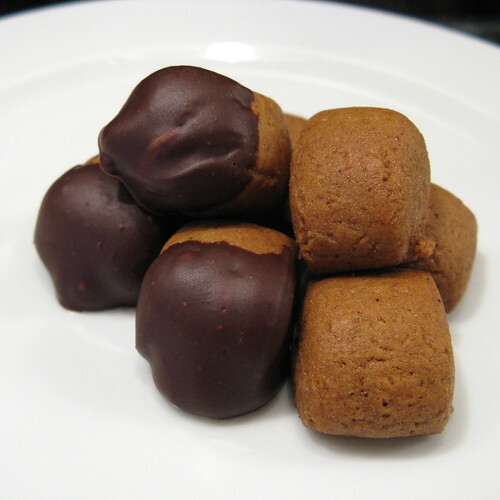 To me, they tasted a a lot like gingerbread cookies without the ginger. Matt's mom said she usually adds more pepper or even cayenne than called for but Matt asked me not to for this batch. Then after he tasted them he decided a little cayenne would have actually added a tasty extra kick. I thought they were a little plain looking & decided to dip half of them in chocolate. Matt said if I was going to do that I might as well add some cayenne to the chocolate too. 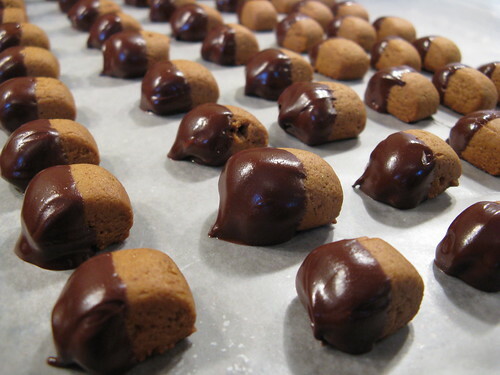 So, we ended up with three different versions of pfeffernusse; plain, chocolate covered & cayenne chocolate covered. They are all good but I think the cayenne chocolate covered are the best. Put the molasses & butter into a saucepan & heat over low heat until the butter is melted. Pour into a large bowl & let cool to room temperature. Beat the egg into the cooled molasses & butter. Stir in the brown sugar, cinnamon, baking soda, cardamon, allspice & pepper. Add the flour 1/2 cup at a time, incorporating each addition completely before adding the next. Cover the bowl & chill the dough for an hour. Divide the dough into 12 even pieces. Roll the piece each out into 10-inch lengths. Cut each length into twenty 1/2-inch pieces. Place the pieces 1/2 inch apart on an ungreased cookie sheet. Bake for 10 -12 minutes until the sides of the cookies are firm & the bottoms lightly brown. 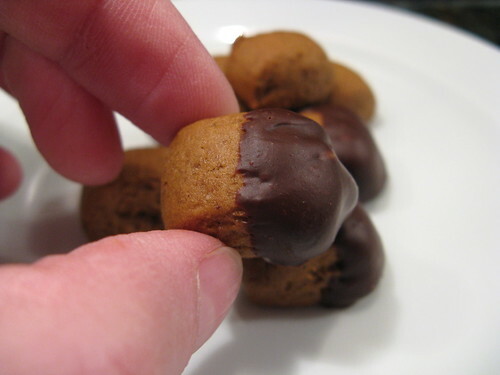 Dipped the cooled cookies into the melted chocolate coating about 1/2 of the cookie. Place on a cookie sheet covered with wax paper. Chill in the refrigerator until the chocolate hardens. Do the same as above but mix the cayenne pepper into the melted chocolate. These are my favorite so far. and I love spice, pepper or anything that adds a kick on cookies! I love pfeffernuse. I have never had it with chocolate. I made it last year the classic way with confectioners. Is it classic I dont know now. Anyway these look so munchable! These were my moms favorite cookie! but I don't think she ever had them dipped in chocolate--that's a really nice addition. And cayenne? Mmmm! I love that idea! I have nener even heard of pfeffernusse. But I am a firm believer that anything dipped in chocolate must be good!! Well photo'd, a new treat for me and I;m going to have fun pronouncing these! They're cute! I'm liking the chocolate and spice combinations. It packs a punch (as far as chocolate goes). Pfeffernusse is great stuff, although I've only had them powdered with sugar. I think I like your chocolate dipped ones the best.